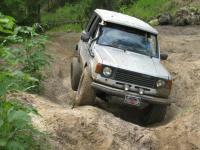 The Dodge Raider was simply a rebadged Mitsubishi Pajero known as the Montero in North America. It was only imported and rebranded by Dodge for three years during the first generation body design of the Mitsubishi Montero. Although the Montero was produced as both a two and four door SUV the Raider was only available as a two door model with a rear hatch. The Mitsubishi Pajero was rebranded as the Montero for North America and first introduced in 1982 as a recreational vehicle to compete with the Land Rover, Toyota Land Cruiser and the Nissan Patrol internationally. The success of the Mitsubishi Montero over the first five years led to a new redesigned model with upgraded amenities including alloy wheels, front seat heaters and covers along with a premium sound system. 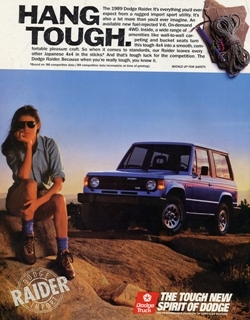 Dodge rebadged the two door version as the Raider for model years 1987, 1988 and 1989. Dodge marketed the Raider to the North American market as a rugged SUV similar to the Jeep Wrangler (YJ) and included both standard and diesel four cylinder engines as well as a 3.0 liter V6 motor. Part-time four-wheel drive was standard on all models. Like other box-like rugged SUVs of the time including the Wrangler and Suzuki Samurai, the Dodge Raider is typically heavily modified for off-road use. This includes adding lift kits and other custom suspension parts along with heavy-duty bumpers, racks, mud-terrain tires, winches and other 4×4 accessories.